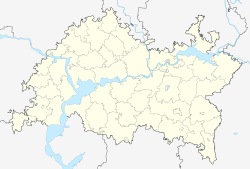 Yelabuga (alternative spelling that reflects the Cyrillic spelling: Elabuga; Russian: Ела́буга; Tatar: Алабуга) is a town in the Republic of Tatarstan, Russia, located on the right bank of the Kama River and 200 kilometers (120 mi) east from Kazan. Population: 70,728 (2010 Census); 68,663 (2002 Census); 53,537 (1989 Census). The former name of the city was Alabuga. Its history dates back to the 10th century, when a Volga Bulgarian border castle, the so-called Alamir-Sultan castle was built by Bulgar Khan Ibrahim in 985 CE. The castle was built on the place of the legendary tomb of Alamir-Sultan (Alexander the Great "Macedonian")[vague]. The name 'Alabuga' originally referred to the tower of the castle, later the whole city was named Alabuga. The castle was later abandoned, and its remains are now known as Şaytan qalası (Shaytan's castle). 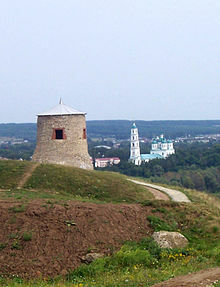 In the second half of the 16th century, a Russian village was founded on the same spot. Within the framework of administrative divisions, Yelabuga serves as the administrative center of Yelabuzhsky District, even though it is not a part of it. As an administrative division, it is, together with the selo of Tarlovka, incorporated separately as the town of republic significance of Yelabuga—an administrative unit with the status equal to that of the districts. As a municipal division, the town of republic significance of Yelabuga is incorporated within Yelabuzhsky Municipal District as Yelabuga Urban Settlement. Oil industry is present in the town. In the 1990s, a Ford assembly plant operated in the town. In 2008, Sollers JSC built a new factory to produce the Fiat Ducato. There is also a factory for the production of household appliances: domestic oil electric heaters, electric meat grinders Italian group De'Longhi. Public transportation needs are served by a bus and taxi networks. Plans for a trolleybus route are being discussed. The town is the birthplace of painter Ivan Shishkin. Nadezhda Durova, who, disguised as a man, was a highly decorated cavalry officer during the Napoleonic Wars died there in 1866. It is also where the Russian poet Marina Tsvetayeva committed suicide in 1941. The poet is buried at the municipal cemetery. Near Yelabuga is the Nizhnyaya Kama National Park. ^ , , Search Google for "Elabuga"
Государственный Совет Республики Татарстан. Закон №22-ЗРТ от 31 января 2005 г. «Об установлении границ территорий и статусе муниципального образования "Елабужский муниципальный район" и муниципальных образований в его составе», в ред. Закона №145-ЗРТ от 30 декабря 2014 г. «О внесении изменений в Закон Республики Татарстан "Об установлении границ территорий и статусе муниципального образования "Елабужский муниципальный район" и муниципальных образований в его составе"». Вступил в силу со дня официального опубликования. Опубликован: "Республика Татарстан", №№18–19, 1 февраля 2005 г. (State Council of the Republic of Tatarstan. Law #22-ZRT of January 31, 2005 On Establishing the Borders of the Territories and the Status of the Municipal Formation of "Yelabuzhsky Municipal District" and of the Municipal Formations It Comprises, as amended by the Law #145-ZRT of December 30, 2014 On Amending the Law of the Republic of Tatarstan "On Establishing the Borders of the Territories and the Status of the Municipal Formation of "Yelabuzhsky Municipal District" and of the Municipal Formations It Comprises". Effective as of the official publication date.). This page was last edited on 27 January 2019, at 11:07 (UTC).